Saturday will be the second anniversary of the death of Nelson Mandela. There are no major events to mark the passing of South Africa’s founding father. As time goes by, it seems the country moves further and further away from the nation Madiba envisaged. As South African society grows increasingly restless with the state of decline, there are rumblings of discontent about Madiba’s legacy, the compromises made during the period of transition and the concept of reconciliation that defined his presidency. 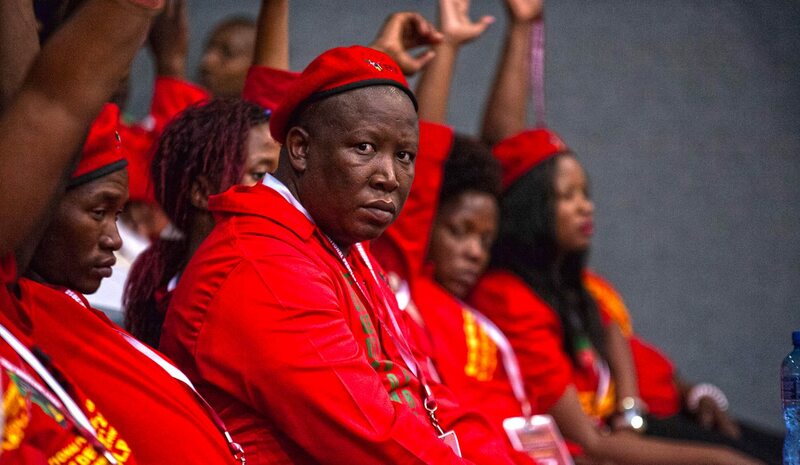 Economic Freedom Fighters (EFF) leader Julius Malema is actively tapping into that sentiment. And there is no saying where this might lead. By RANJENI MUNUSAMY. Julius Malema’s remarks about Nelson Mandela during his recent trip to the United Kingdom have sparked much controversy. There are certain things that are just not done. Putting money on Bafana Bafana is one of them. Trying to out sing President Jacob Zuma is another. There is no greater treachery than denigrating the legacy of Nelson Mandela – well, unless you are one of his descendants, in which case it appears to be an obligation. Malema however voiced sentiments that have been bubbling under in society, particularly amongst the youth who have brought about a resurgence of activism. Addressing the Oxford Union last month Malema said Mandela had sold out the Freedom Charter and ultimately the revolution. “The Nelson we celebrate now is a stage-managed Mandela who compromised the principles of the revolution, which are captured in the Freedom Charter,” Malema was quoted as saying. This, predictably, caused uproar, with Malema being criticised by ANC and ANC Youth League leaders, as well as the Mandela family who said his assertions were “ridiculous”. At an EFF media briefing on Wednesday, Malema sought to explain his comments. He said while he stood by his statement that fundamental principles of the Freedom Charter were compromised, it was not Mandela alone to blame for this. “A collective of the ANC compromised the Freedom Charter. You [the media] chose to say I said Mandela sold out,” Malema said. Of course he could have stopped there. All would have been as it should be. The Mandela legacy would have returned to being warn and fuzzy. But Malema never leaves comfort zones intact. “I don’t belong to a religion called Mandela… President Mandela was a human being like all of us. He’s got his own shortcomings. His legacy and his contribution to the struggle will be a permanent subject for critique in South African politics,” Malema said. So why is Malema rattling this particular cage? Surely there are enough weaknesses in the ANC for him to target without venturing into sacred territory? But Malema is tapping into the growing restlessness and anger of people stuck in a state of hopelessness, searching for the root cause of their misery. During the student uprisings #RhodesMustFall and #FeesMustFall, there were frustrations voiced about the negative repercussions of the reconciliation project on society now. There were too many compromises during the transition phase, too much of society remains untransformed, white people still control the economy, and so on. These sentiments have growing resonance. The concept of the rainbow nation and democratic South Africa’s core tenet of non-racialism lies in tatters as debates on race float at the top of the national agenda. So who sold us the lie? Who led us down the path of deception about a reconciled nation where race didn’t matter? During his media briefing, Malema crossed the invisible line that should not be traversed several times, and then veered into a safe space. His ire was saved for Mandela’s grandson, Mandla, whom he called a “small boy” and questioned what he did to earn a seat in Parliament. Malema said Mandla had used his surname to further himself and challenged him to a public debate on his grandfather’s legacy. Mandla responded on Thursday saying the only debate worth having is “what brand of soap would best wash out his (Malema’s) mouth”. “Besides disrespecting an elder‚ who is revered across the country and the planet‚ and palpably failing to grasp the reality of negotiation processes‚ he trashes the reputation of our country in the eyes of the world. As if that is going to help stimulate growth in our economy‚ and jobs and dignity for our people,” he said. Graca Machel also responded to the criticism of Mandela’s legacy during a meeting with Britain’s Prince Harry at the Nelson Mandel Centre of Memory in Houghton. “I’m not worried about attempts to attack Madiba’s legacy because it will stand test of time. It’s not an issue for a sleepless night,” she said, according to media reports. But Malema is a shrewd politician. He knows that despite the widespread sentimentality about Mandela, there is latent resentment about the liberties allowed to white people and how reluctance to share in the country’s wealth is relegating another generation of black people to a lifetime of poverty. Malema said at the media briefing that he did not care if his criticism of Mandela cost him votes. “If you don’t want to vote for me because I’m critiquing Mandela then you want to live a lie. Give your vote to those who live a lie. I don’t live a lie,” he said. But the romance of the Mandela era has long faded and there is little being done to keep his memory and legacy alive. Other than being occasionally quoted in speeches, Mandela’s legacy has no impact on contemporary politics. His party, the ANC, is so steeped in power battles and protecting its leaders that it has neglected the memory of its greatest asset. The Mandela family has its own sordid scandals that desecrate one of the revered names in the world. South African society is caught up with day-to-day battles for survival and rarely has time to defer to the memory of its founding father. Therefore what might appear to be a risky move on Malema’s part is actually a shrewd manoeuvre to grow his constituency of frustrated, discontented people. The more South Africa unravels, the more people will rebel against who or what they think is responsible for creating such an unequal society. This was apparent from the #RhodesMustFall movement and why #MandelaMustFall is not an unthinkable concept in a restless society. Photo of Julius Malema by Greg Nicolson/Daily Maverick.